When it comes to PTA advocacy, it’s important to remember a few things. First, pay close attention to what your state legislature is doing—it’s up to you to be a watchdog for all children. Next, finding an issue that resonates with your membership is important—making a difference requires a surprising amount of grunt work, so it’s important to stay passionate. And finally, even a handful of PTA advocates can make a big difference. Those are the lessons Illinois PTA learned in 2016. Senate Bill 550 (SB 550) began as a technical change to the Nuclear Facility Safety Act and wandered through committees for over a year until an amendment in May 2016 completely changed the bill. The bill was now one that would require testing every unique drinking water source in all Illinois public, private, charter and parochial schools for lead. Illinois PTA noticed the change and filed online witness slips in support of the bill. SB 550 passed the Senate on May 31, the last day of the legislative session, and headed to the House where it was assigned to the Rules Committee—a place where bills languish and die from lack of support. Adopting a state budget, as Illinois was in the second year without. Supporting a bill to ban the sale of energy drinks to minors based on a PTA resolution. 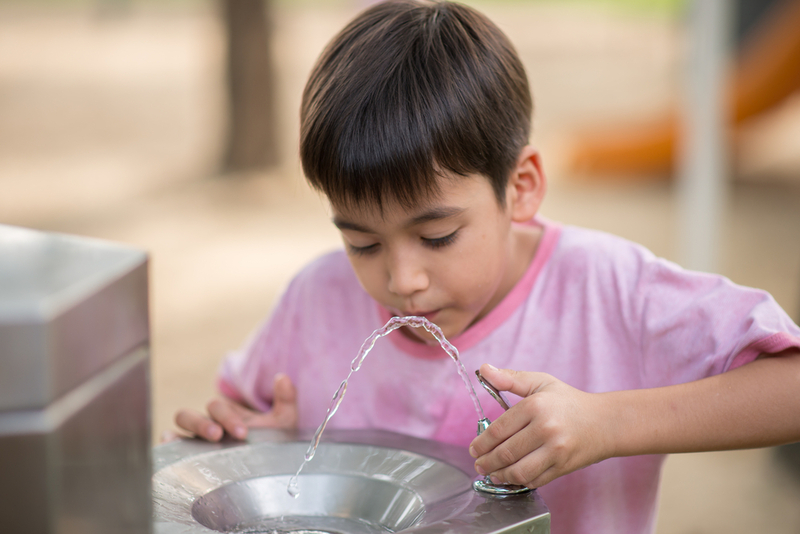 Supporting SB 550, now known as the Lead in Drinking Water Prevention Act. About a dozen people showed up for Advocacy Day in Springfield, and few were able to get meetings with their actual legislators, so we visited as many legislative aides as possible. As we visited, it became apparent that just about every advocacy organization and lobbyist in Springfield that day was talking about the budget. Mention the budget, and the aide’s eyes would glaze over, and they would just nod along. But when we mentioned SB 550 and testing for lead in school drinking water, they perked up. We shifted our pitch from focusing on the budget to advocating for SB 550, and by the end of the day, we had personally spoken with 79 legislators and staff. Something else happened that day as well—by that evening, SB 550 had suddenly picked up three new co-sponsors. Illinois PTA knew that traveling to Springfield would be difficult for some people, so we had also run a “Virtual Advocacy Day” on Nov. 16 using Voter Voice to encourage those who were unable to attend to contact their legislators. We followed up the next day on our blog, One Voice Illinois, encouraging members to continue to contact their legislators. Throughout the veto session, the bill continued to add co-sponsors, passed through committee with a “Do Pass” recommendation, and had its second reading in the House (all Illinois bills are required to be read on three separate days). There, the bill stalled at the end of the veto session. In a normal year, that would have been the end, but the legislature planned to come back for a lame duck session in January just before the legislators elected in 2016 were sworn in. So, Illinois PTA decided to really push on SB 550. A blog post on the issue prior to the holidays also went out in our Weekend Update email blast. Contacting legislators in support of SB 550 was one of our four New Year’s resolutions for PTA leaders. A new call to action through Voter Voice had a huge response from our members, and a whopping 78% of our members responding to the call were first-timers. During the lame duck session, SB 550 added over a dozen new co-sponsors, though an amendment that scaled back the lead testing to schools up through grade 5. The amended bill passed the House with only one no vote and one member voting present, and the Senate concurred with the amended version unanimously. The governor signed the bill into law on Jan. 17. So what has been the result of SB 550 becoming law? School districts across the state have been testing lead levels and begun dealing with those drinking water sources with dangerously high levels that have been harming children for decades. Illinois PTA highlighted news reports from just a few of the districts that were taking action. There’s still more to be done—Illinois PTA would like to see mandated testing at the middle and high school levels as well—but with the passage of SB 550, families are being notified when high lead levels are found, and many school districts are already undertaking that testing in middle and high schools on their own.